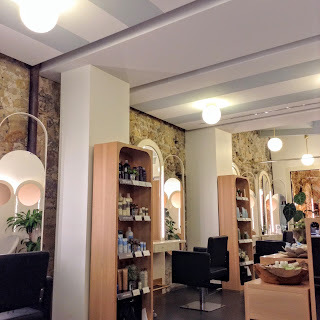 J'ai peur des coiffeurs. The dentist? Pas de problème. No iatrophobia here, either. In my lifetime I went to the hairdresser, at most, once every two years. My mom cut my hair and tweezed my eyebrows until middle school; I was out of college before anybody touched my head again, each style more traumatic than the last. There was a period when the only haircut anyone in Cleveland did was Flock of Seagulls. Another stylist gave me what is perhaps best described as "pre-pubescent Golden Girls." Mixed-race locks are tricky. "Don't take this the wrong way, but... are you black?" one stylist asked me, confused. "Your texture is like mine, only, not soft." She wasn't wrong. If I'm not careful, my hair easily veers into Louis XIV territory. It's been awhile since my last water-only update, and instead of boring cross-cultural comparisons, I decided to be your anthropological test bunny, examining the coiffures endemic to each country. There is, after all, no more faithful representation of humanity than its hair salons. "Brushing" in France is what a blowout is to Americans. 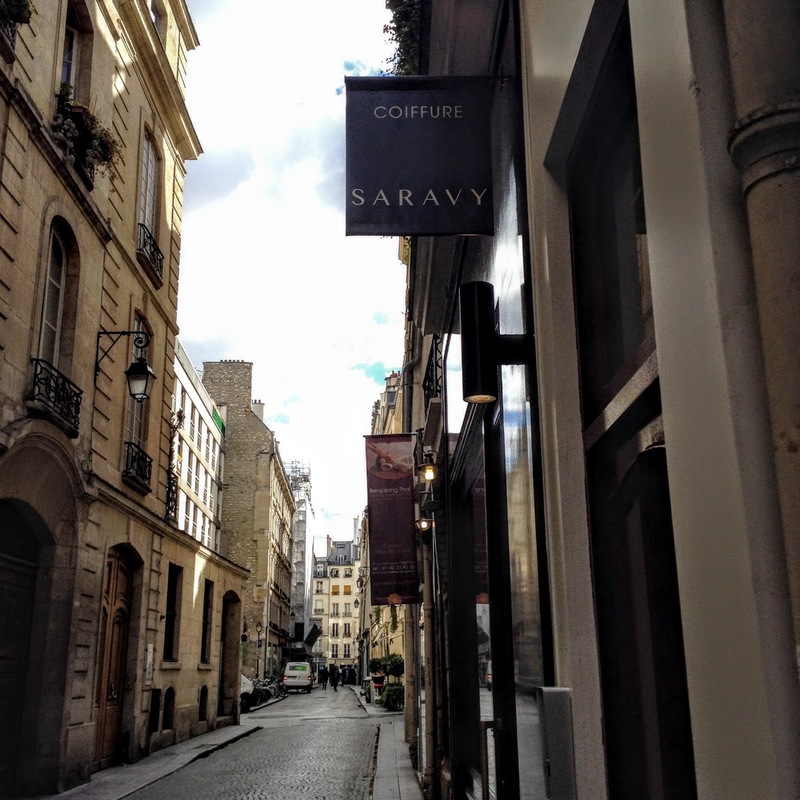 Whereas blow-dry bars exist even in my Kraft Ranch-dipping, LeBron-loving birthplace, Paris has nothing of the kind. Rather, many women I know have standing appointments- a fact learned when my friend announced she found a new, cheaper salon than the one she visited for years, and the money saved on weekly styling could buy a bottle of whiskey. In Cleveland, I did a banana hair mask and asked for water-only at the shampoo bowl. The stylist complied. "Probably ten years ago, someone would fuss about it. Today, we all know there's bad stuff in products," she said, pointing to her ponytail. "I wash my hair every two weeks- that's why it's up now." There's no denying she did a good job. She didn't flinch when chunks of banana flew out of my hair. She even complimented the cut, which I did with a safety razor in the bathtub. Still, I couldn't help but think I looked like My Pretty Pony. It was sleek and neat, but it didn't look touchable. I felt that, at any moment, I could be kidnapped and carried to Midnight Castle. 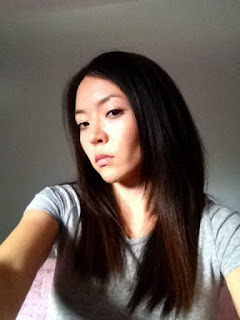 Blowout #1: Test-driving an Asian version of "The Rachel"
Finding a stylist in Paris was... intimidating. Maybe I'm overreacting, but some seemed like bullies. One pulled a grey hair from my scalp. "Your face is too fat for long hair," another pronounced. 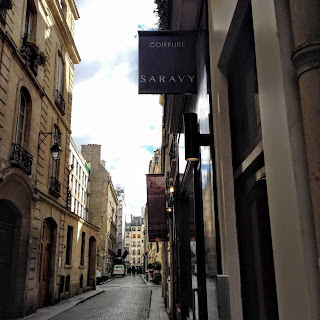 Finally, I found Saravy, one of four Paris salons carrying Aveda products (if you prefer a Korean salon, Dupleix Coiffure is amazing! 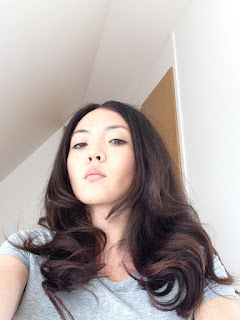 I had a great blowout there for an amazing price- and my scalp felt squeaky clean). The interior was serene and calming. I arrived ten minutes early for my appointment, and Saravy, the eponymous owner, offered me a pot of mint green tea with fresh fruit. 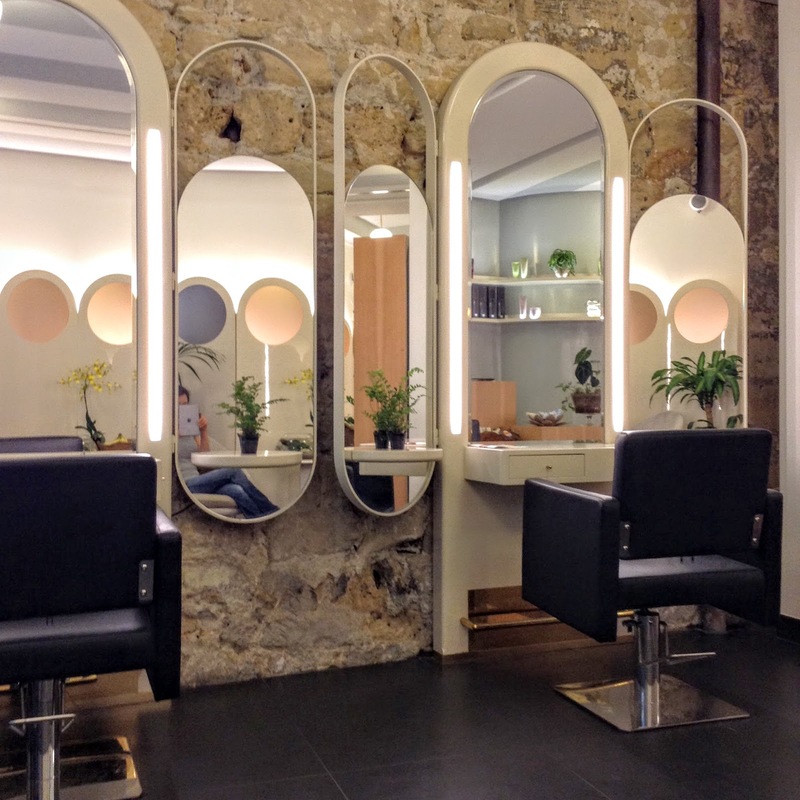 French coiffeurs take pride in their consultations. They look at your clothes, face shape, and lifestyle before attempting a cut. I slipped into a robe and went to the sink, where Sandra, my stylist, elevated the footrest via remote control. Images of sunrise above a seaside mountain played on the wall. She massaged my scalp with water and started brushing. "I've never seen an Asian with curly hair!" she exclaimed. I told her I lived in France three years, and that my French should be better by now. Sandra agreed. "I love the show Orange is the New Black," she said, curling my hair around a brush, shaping it with her fingers. "If I went to America, and asked for a wavy blowout, could they do it?" "I don't think so. They only iron my hair. I prefer this. It's more natural!" I love the result! I feel like I'm finally in on the secret for perfect French girl hair. It's age-appropriate and matches my outfits. Best of all, Sandra didn't try to make me buy stuff or pressure me into unwanted treatments. For her, straightening was unthinkable. I made another appointment right away. I like the French blowout better because Americans are always trying to make me look like someone else. They're always saying, "Why don't we do Victoria's Secret hair?" or "Why don't we try a Taylor Swift bob?" French stylists, in general, seem to prefer the natural texture and color of hair, which may be why Parisian highlights are barely perceptible. French women cut their hair more often, I'm told, so they can air-dry or wear their hair messy, and it still looks nice. P.S. Yes, that's a new t-shirt, $3 at Volunteers of America. Somebody poured bleach on my old ones, resulting in gaping holes, so I went to the thrift store and replaced them in seven minutes... I'll explain later. Every hairdresser I've been to (in America) has complimented my curly hair and then proceeded to blow dry it straight. I don't let anyone blow dry my hair any more! Why do they do that? And straight haired girls always want curly hair... good for you embracing your beautiful curls! They do that to me too. I dont have curly hair but some waves if I dont brush my hair ( I dont ). They then straighten the heck out of it. I've seen curly blowouts before in the U.S., but never as natural-looking as yours! I have a great stylist, but even she really will not work with my wavy texture. I hate leaving the salon, because it seems like the goal is always to make my hair as flat and straight as possible, and what I want is (my natural) volume and (my natural) waves. 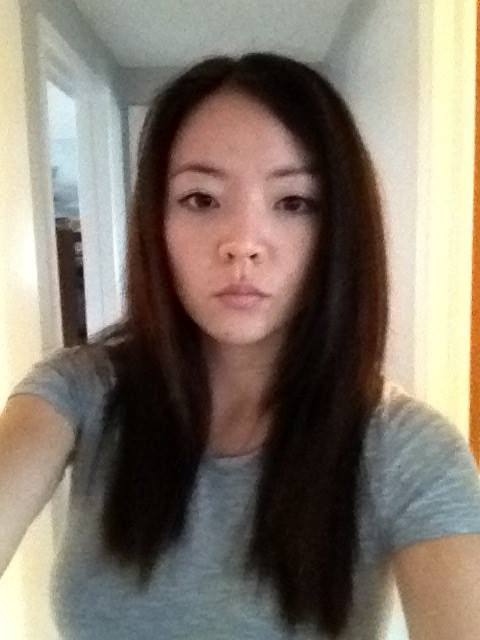 Straight hair looks way too severe on me, especially as I get older. I also have the shade of light brown/dirty blonde hair that makes every hairstylist say, "You could go blonde!" I never even heard of a curly blowout before! I'm curious now.That's another thing- my husband commented on how many women in America were blonde, and he said "They are blonder than even Scandinavian women, but it's not a natural blond" and it freaked him out. The menu at Dry Bar (NY) has some wavy and some curly options. Hi Sadie, those are really cute! Thanks for sharing. Would you recommend the experience at Dry Bar? Now that you mention it, I went to a blow dry bar in Miami once and they had curly options too... but they straightened my hair so I guess I just forgot. Sound like a simliar experience to aveda salons I go to. In my limited hair salon experience I find aveda salons know how to cut curly hair. Do they all do the head massage? I'm curious, because it was the first time I had one at a salon and it was amazing! Glad someone knows how to work with curls. I read Deva salons are not bad for curls, either. Ok, be honest.In the photos immediately after "I love the result"- are you wearing any makeup? Because if not, I may have to hate you. In the nicest possible way, of course. My dermatologist does recommend wearing makeup (foundation) as long as it's non-comedogenic. It creates a barrier to things such as the harsh wind. Like you Ariana, my skin is better if I put that barrier on otherwise it looks red and dry by the end of the day even with a good moisturizer. I usually wear a whipped cream foundation as it works well with my skin type. Hi Cassie, thank you so much! Now I can water wash once a month. The heaviness is the adjustment period. How long have you been doing it? Is there anything else you are using in your hair? I stopped putting oil in it and massaged my scalp and worked the oil down to the ends of my hair which alleviated some of the heaviness. If you push through the heaviness a few days, I noticed that you can wake up with good hair after it looking kind of greasy for awhile... it does get better, I promise! I go only once a year, have it trimmed and then washed with only water. They give me a haid massage to "compensate" for the no shampoo (I once left with a terrible allergic reaction, and since then no shampoo will touch my hair). PS: I tried the sugar water hair spray to hold my curls into place... the easiest recipe ever, and with great results! Ooh, Emma, where did you find the recipe? That is awesome. I am sorry about your allergic reaction. I've had the same problem! I use lemon or lime juice right now to hold my hair but I wonder if it will dry my hair out. Hi Ariana. Funy, i found it on a website for vintage beauty secrets. For me, this works fine and doesn't dry out my extremely dry hair, as the lemon would. The allergy is fine, helps me to use fewer products, Jeej! Thank you! Vintage beauty secrets, I love it. No, your beautiful linen t-shirts were vandalised?? I am ages away from sustainability, but on your advice (recommendations? My highly suggestible nature?) I went and invested in a linen tee. Sadly it has a small percentage of nylon in it, but it drapes well and will dry quickly. I have become so attached to the images of your two linen tees I am eager to find out what happened to them! Where did you find your linen tee? They really are the best. Unfortunately someone wanted to help with my laundry and poured bleach on them (which, I read that bleach yellows linen? have you had this experience?). The t-shirt I'm wearing now is cotton with a tiny percentage of elastane as well. Lately everything I find has elastane in it, I read lots and lots of tags and it's all the same. I bought another one at the thrift store that I believe is linen though. I'd take a look at Maisons Standards, they have a 100% linen and while I do not own one, I have their cotton tee and it's really good quality. A bit expensive though. Thanks for the recommendation! I've seen that label at Violette Leonie. Must be a French thing- Petit Bateau linen t-shirts are 100% too. I'm in Australia and got it from Country Road. There was a 100% linen option but the colour and cut were very unflattering. I did manage to find a petite bateau one though, like yours; was so stoked! I've never used bleach on clothes before so I've no wisdom to drop there, sorry. Ah, I understand. Thanks for sharing! Your hair looks great! It is interesting that French women seem to make the best of what they have got rather than trying to look like someone else. 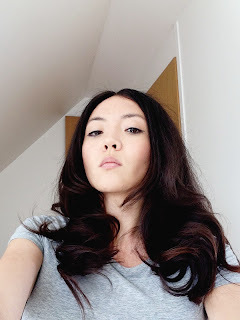 I go to an Aveda salon here in Australia 4 times a year and I always get them to do a curly blow dry. I like it and get lots of compliments but never quite feel like 'me' somehow. I have corkscrew curls so I am usually back to myself with 5-6 days. My curly locks are what people remember about me...I am 'Curly Claire'. Corkscrew curls, I'm jealous! My hair used to be like that until I did the permanent straightening, now the curls are not so prominent. Can you brush your curls without them coming out? Before, when my hair was really curly, I never used a hairbrush, I just finger combed them from time to time. Do you have a picture of your hair before the blowout, just with water only? I'm considering making the switch but I'd be interested to see what your hair looks like naturally, since I think we have similar texture. Fifty some years ago I grew up in a small town in Ohio. There was a young woman of Asian heritage who attended the local college. She had beautiful long hair, and rumor had it that she never used shampoo and seldom washed her hair, even with water. Instead she would brush her hair daily with a natural-bristle hair brush. The idea was that the brush would distribute the oil from her scalp to the ends of her hair. (This was in the early '60s.) Plus ca change . . . . I didn't know you grew up in Ohio! My mom and grandma told me about women in Korea who washed their hair maybe once a year or something and they never smelled because they cleaned it with a special brush. In China the women who use fermented rice water do the same thing. It was so nerve wracking being shampoo free in Ohio though. People there love their daily shampoo. I have to hand it to her, that was pretty brave. Thanks for sharing the story! Hello Ariana! 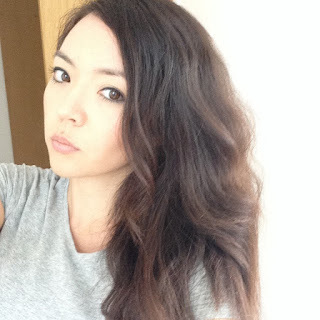 I love your blog :) I wanted to ask about your water-only hair routine. Are you still doing that? If so, do you just wear a haircap in the shower to not get your hair wet? Or do you wet your hair everytime you shower? 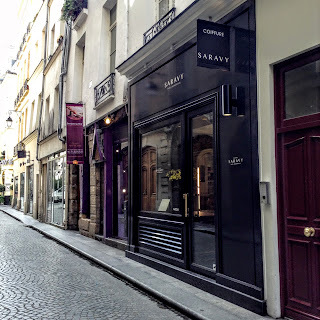 Hi, thanks for sharing your recommendation on Saravy, I will see if I can get an appt next week while visiting. Silly question but do you tip in Paris for hair services? Thanks! Hi MJ! You will love them. You tip, but not as much as in the US, normally people give 2 euros. I tip more because my hair is really long though. Have fun!